In his sleeve-notes to this disc, Dr Paul Andrews points out that the continuing good reputation of the composer Herbert Howells rests on far too few works and, judging by this new album, he is absolutely right. It seems that there are quite a few more of Howell's choral pieces out there than one might hear on a regular basis in Cathedral repertoires and this disc clearly demonstrates that they are all worth getting to know. Central to this album is the mass setting: Missa Aedis Christi written for Christ Church Cathedral, Oxford and first performed in 1962. Whilst not exactly 'lost' from public consciousness this recording will hopefully do much to convince us all that it is worth restoring to more regular performance. This Mass is quintessential Howells and the beauty of the vocal lines come through clearly on this recording. I have always been aware of feeling that something is being remembered in Howells' music, as if worship were an act of communication that draws on previous conversations as much as the present and future ones. Judy Martin coaxes this reflective quality out of her singers and they give a wonderfully inspiring performance here. There is also a strong sense of this music as an enhancement to worship rather than a distraction from it and once again I find that that quality is beautifully observed; '…the worshippers are surrounded by a sensual, impressionist waft of sound…' as Dr Andrews elegantly explains. Interlaced with the Mass setting is a charming collection 'Six Short Pieces for Organ' stylishly played by Tristan Russcher and most interestingly explained in the booklet notes. 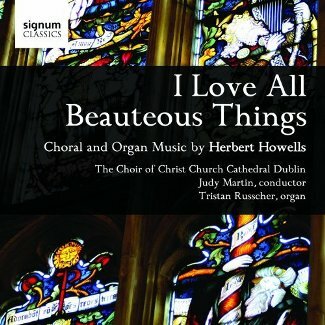 These pieces alone must hold quite a bit of attraction for Howell's fans and the organ at St Bartholomew's Church in Dublin (where this whole album was recorded) proves itself to be a very fine instrument for Howell's music indeed. The Choir of Christ Church Cathedral, Dublin conducted by Judy Martin are an adult choir of some twenty-two singers and have a beautifully balanced sound and a calm, unhurried style which make them very much at home in Howells' music, and with their organist, Tristan Russcher, they maintain a standard throughout this recording that all cathedral choirs would be proud of. It is particularly pleasing to hear a mixed-voice Cathedral Choir making such an accomplished disc as this at it should do much to reassure purists that music conceived originally for choirboys is well served by the female voices that have finally been allowed into the cathedral choir system. Listening to these sopranos in 'Sweetest of Sweets' (for example) it is obvious that they are female voices, and I respect the fact that they sound like women rather than women-trying-to-sound-like-choirboys, but I don't find this femininity at all musically distracting. It is a very becoming sound and the fact that it ends up not a million miles away from the traditional male cathedral timbre has more to do with the expert way that Judy Martin has balanced and directed her choir rather than mimicry on the part of the ladies. So this album is a welcome addition to the recorded works of Howells both on account of the repertoire it covers and because of it's fine performances. This choir and Signum records might well have hit on a winning formula here, and their association is defiantly going to be one to watch.